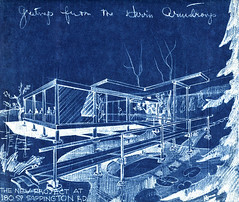 architectural ruminations: "Seasons Greetings from the Harris Armstrong's"
A blueprint of a perspective sketch of Harris Armstrong's Architectural Office (1948)was sent by the Armstrong's as a holiday greeting. The sketched image (by Armstrong) is printed "reversed" in the sense that the very whitest areas indicate the darkest shadows. This method is the traditional "blueprint" which today is rarely if ever used (initally replaced by "blueline" and "blackline").